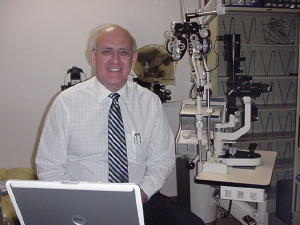 Our Practice - Clerico Optometry, P. A.
Hi, I am Dr. John Clerico. I have lived and practiced Optometry in Winston-Salem for thirty one years.I graduated from Ohio State University College of Optometry in 1975. Through the years my goal has been to examine, evaluate, and find the best solution for my patient's eye care needs. I look forward to many more years in serving my patient's eye care needs. Areas of special interest to me are pediatrics, contact lenses, medical management of eye disease, and general family eye care. Recently, I have upgraded several pieces of equipment to assure that I stay on the cutting edge of technology. This will also allow me to take better care of my patients. I now have the capability to photograph the retina and monitor changes over time with my new 16 megapixel digital camera. Welcome to my practice and I do look forward to serving your eyecare needs! I would like to introduce you to our staff. Holli Rhoney is my Optician. She received her Optician's license in 2002. She has been working in the office since 1996. Frame styling, lens selection, advising tints, informing of new optical products, adjustment of eyeglasses are but a few of her duties in our office. If it is a cutting edge look, or a conservative look, or anything in between, then she will find the look for you. She also does our in house edging. 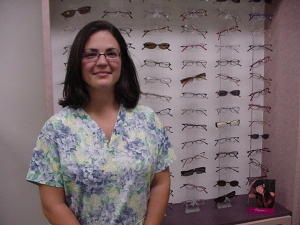 Many times we can have your glasses to you the same day that you are in for your appointment.